Got a lot of bad reviews on NewEgg! By the way Staples also has the Samsung EVO 860 500GB on for $109.99. After $20, that's $89.99 + tax. I think previously the lowest for this one was $99 + tax at Best Buy. I have not had any issues with the 2 I already own. Been using them for a good few years now and they've been solid. I use them to store my movie/tv show collection. Last edited by CorporalJenky on Mar 15th, 2019 11:51 am, edited 1 time in total. Thanks to Bob, great work. Thanks for the coupon and deal Bob! Very much appreciate it! Same! I used the 3rd one from the bottom. Glad to hear! Thanks for the feedback! I just might pull the trigger on this based on your feedback!! can someone PM me a $20 off coupon Thanks! Last edited by battlezone on Mar 15th, 2019 12:15 pm, edited 1 time in total. 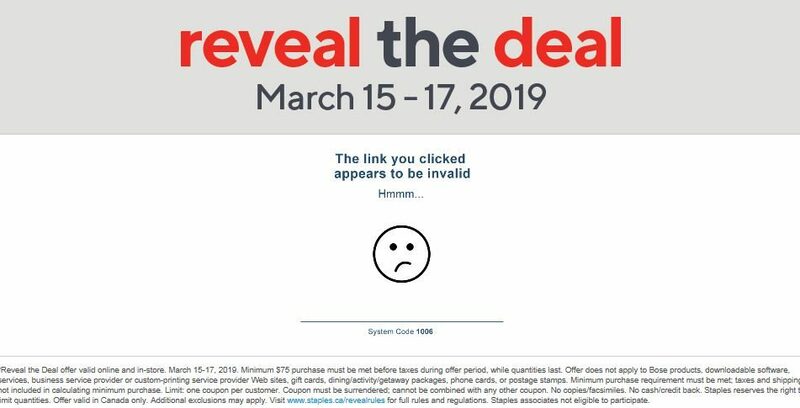 Reveal the deals doesn't seem to work for me, can someone PM me a $20 off coupon. Thanks! Thanks OP for the link and the code!